cubantravels has been a member since January 27th 2014, and has created 37 posts from scratch. At Cuba Travel Services, we get requests all the time from people visiting Havana who search for cheap hotels instead of Casa Particulares. While we do offer Casas in Havana, some of you don’t want to deal with Cuban hosts or the lack of privacy associated with a casa particular. Therefore, we have listed below the worlds cheapest hotels in Havana. These are basics digs but are clean and presentable, clean sheets and clean rooms. Each hotel listed offers free breakfast also! Don’t expect the best views or the nicest rooms but do expect cleanliness and international TV plus all the other benefits of a hotel. The rates of these Hotels in Havana are rock-bottom, we are talking about 17-30 USD per night with breakfast thrown in! As always, Cuba Travel Services gives you what you search! Cuba Travel Services offers bookable Casa Particulares in Havana Cuba. Below are 8 different casas we have personally visited over the past 12 months and can ensure quality of service and great Cuban hosts. Reserve any of these casas in Havana online and we guarantee your booking is secured. Forget about all these third party “friend” sites, Cuba Travel Services has been providing reliable online bookings for Cuban Hotels, Cuba Car Rental and now Casa Particulares since 1995. 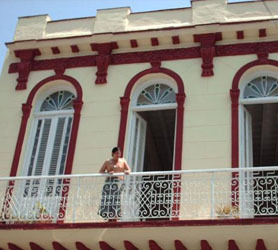 Click any of the links to see other casa particulares in Havana available. Book your Casa Particular with Cuba Travel Services to avoid disappointment! Cuba Travel Services is proud to announce new deals on Hotels in Santa Lucia Cuba. Playa Santa Lucia is the perfect destination for those looking for all-inclusive hotels at a budget rate. Just 100km (62 miles) from Camaguey it’s an easy place to get to by car or by plane. The benefit of staying at Playa Santa Lucia is of course the discounted hotels. 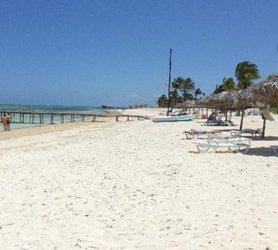 Despite being on the same Jardines del Rey axis, with the same reefs and, one of Cuba single longest beaches (21km – 13 miles), the hotels are mainly 3 and 4 star all-inclusive offering better value for money. One great asset of Playa Santa Lucia is the virgin island of Cayo Sabinal, a favorite destination for boat trips from Santa Lucia and true paradise oasis. Check our our rates on the hotels in Santa Lucia. We guarantee the lowest possible rates or your money back! Book your Cuba Travel Services Playa Santa Lucia Hotel to avoid disappointment and, above all, paying too much! Cuba Travel Services is present in Santiago de Cuba. We have obtained some of the best deals on Santiago de Cuba Hotels available and direct from the source. Cuba’s second capital doesn’t only have city hotels but, also amazing beach resorts and even all inclusive playa destinations. If you are looking for a hotel in Santiago then take a look at our amazing rates before committing elsewhere. Add your Santiago de Cuba Hotel booking to a Cuba car rental and you’ll get a 5% discount on the car! Contact our chat team to get your discounted car invoice. Cuba Travel Services offers the list of Santiago de Cuba Hotels below as a complete list of every Hotel in Santiago de Cuba. Immediate confirmation of all Hotels is assured if available. 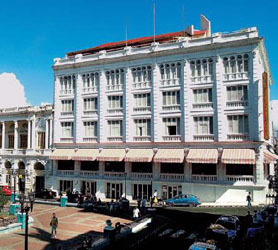 Book your Santiago de Cuba hotel with Cuba Travel Services to avoid disappointment. Cuba Travel Services New Destination – Cayo Santa Maria Cuba is the second largest island in the Jardines del Rey Archipelago, it offers some of the best virgin beaches on planet earth plus, two immense shopping centers and even a dolphinarium. Setting aside the amazing snorkeling and diving experiences on the reefs this has to be one of Cuba’s number one destinations. 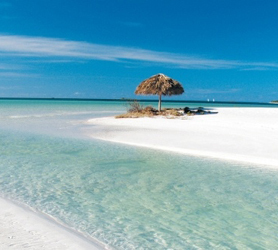 You can even get to the Island of Cayo Santa Maria by car from the city of Caibarien, making this the ultimate “drive-to” beach destination for some R&R and a downtime from your busy schedule visiting family and friends in Cuba. Cuba Travel Services even accepts bookings for Cuban family visiting the island with you! Below is a complete list of the Hotels offered by Cuba Travel Services under our ground breaking rate deal! 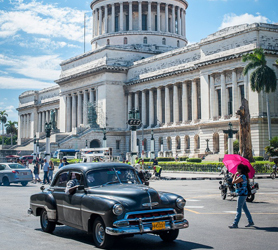 Book with Cuba Travel Services and get 5% discount on your Cuba Car Rental!